1. 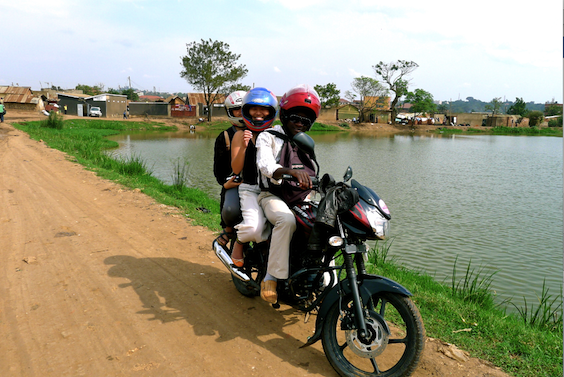 Can you tell us how you started with this boda boda tour business? After high school, I went to South Sudan. I was looking for a job as I couldn’t afford university. I was working there for a few months and decided to come back to Kampala. I got a loan to rent a boda boda for 6 months like any other boda boda driver and I started giving tours to my customers as they told me they wanted to see more of Kampala. One day I realised this can make a difference and be a business opportunity. I tried to find out everything ie. history about the places that I need to tell other people. They kept asking me questions and I find out the answers and that’s how I started my boda tour. Everytime I meet different people around the world, they gave me advice; that’s how I kept going and I came up with many things ie. a Facebook page, and people started writing reviews, blogs and my friends kept passing the word and I’ve 10 boda drivers working for me now. I pay them on a daily basis. They all speak good English, have good experience. Currently I give all the explanation on my tours and I tried to teach them but not all of them picked it up so we do the tours in group so that they can learn it as well. 2. What are some of the challenges that you faced? People kept asking questions of things that I don’t know and that’s exactly why people who compete with me have gone out of business. There were 3 Americans who wanted to partner with me and wanted more shares in my company but we have a lot of arguments. And they started their own business but they couldn’t get any customers. So many Muzungus who know them, they kept recommending me because for them, the quality is better on my tours. 3. What is important to make it as an entrepreneur? For me, I never knew that I would own a business one day so I never knew how to lead but it has been growing slowly. So I think it depends if you like doing something and you try to do it well, then you’ll always be an entrepreneur. For me, I felt that I wasn’t comfortable being just a boda driver but I prefer to have my own company as a tour guide. So I always strive to learn to do it very well; how to tell good stories, how to satisfy my customers, learn what they want, show them the highlights of Kampala and if you don’t know, find out. Be honest and tell them the answers later. So for me I believe being an entrepreneur means doing something and if you like it, don’t just end there, you also learn how to do it well, to have happy customers because customers are the ones who’ll recommend it to others and people then get to know about it. 4. What advice do you have for people who want to be entrepreneurs? People should look at what is in them. They shouldn’t look at what’ll give them quick money or what others have. Look at what they have and how to make it better. Just start from wherever you are and always doing it better. It doesn’t matter what you do ie. being a chicken farmer; have better chicken and others will recommend your chicken. 5. Why is this important (as usual I always end my blog with why what this person is doing is important to me, the writer)? This is important to me because I see so many boda drivers on the streets and it really takes something to (1) recognise an opportunity; and (2) the ability to capitalise on it and start something which will hopefully inspire others. Great article which you share...Walter incredible tour guide. He is a self-made man, and knows Kampala like the back hand.